You know those phones that LG promised would be coming soon with Nvidia Tegra 2 power? Well, looks like we've got our first look at one. The LG Star has been snapped over at the Android Forums, and it's packing a number of high end specs that could help the Korean brand get a foothold in the smartphone market. An HDMI port is the obvious place to start, with a little cover presumably hiding a mini-socket with an adaptor in the box. 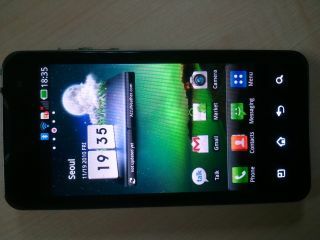 There's also a four-inch screen, although we doubt it's the Super AMOLED variety used by arch-rival Samsung. It's running Android 2.2, but given the close proximity to Android 2.3/Gingerbread being unveiled, we're sure it could be upgraded prior to launch. An eight-megapixel camera with LED flash is fairly standard fare these days, but more interesting is the benchmarking: the LG Star outstrips the competition quite markedly, according to the forum poster. Assuming the images aren't faked, the LG Star outstrips the likes of the Nexus One and Galaxy S by some margin, which should not only make it super fast, it could also be a lot lighter on the battery too. We were told that Tegra 2-powered phones were going to be given a Q4 UK release date, but given the proximity to the end of the year, we'd imagine the LG Star (which will likely be renamed to fit in with the Optimus line up) will probably be now seen at Mobile World Congress in February 2011.